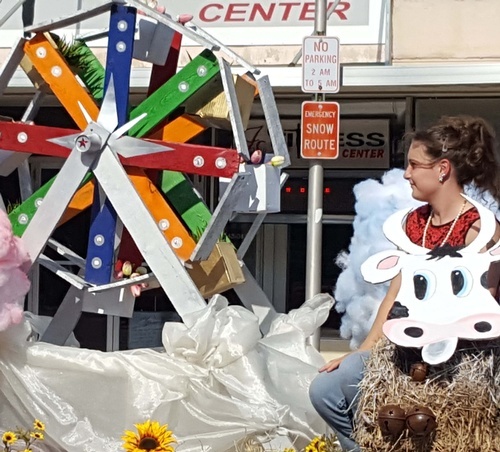 The 2018 Thomas County Fair Parade will be held Tuesday, July 24 at 5:30 p.m. in downtown Colby. Registration is now open. To register your float for the parade, click HERE or call the Chamber office at (785) 460-3401. CHECK-IN: Begins at 4 p.m. at the corner of 8th & Franklin. Check in is REQUIRED. LINE-UP: Do not line up until AFTER checking in! Implements line up on N. Franklin (north of tracks); horses and riders line up at City Hall; all other entries line up on 7th or 8th street. RULES: NO CANDY can be thrown from any entry during the parade due to safety concerns. Walkers can hand out candy along the parade route. DEADLINE: Friday, July 20, 5 p.m.
PRIZES: First and second place will be chosen from each category. First place will receive a $40 Chamber Gift Certificate and second place a $20 Chamber Gift Certificate. The entry whom the judges feels best represents the parade theme will receive a $50 Chamber Gift Certificate. Each entry will be eligible to win their category and/or the Best Representation of the Parade Theme prize.